NPA's proven auction processes include all of the services necessary to efficiently and consistently deliver maximum returns on your inventory. From transportation and title services to inventory management and custom reporting, NPA has the best staff and systems in place to handle all the diverse needs of powersports industry OEMs, financial institutions and dealers. 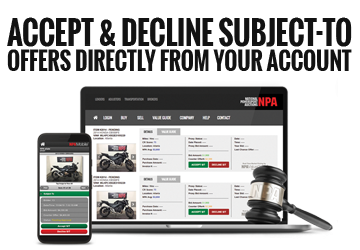 NPA provides all the services necessary to liquidate powersport vehicles, from transportation, title work, inspections, reconditioning and repo management to live and online auctions, electronic funding, co-marketing, and comprehensive vehicle tracking and reporting capabilities, including secure, electronic data transfers. We take care of all the details required to turn secured collateral into cash through our proven, streamlined process. NPA has an experienced team that can handle any documentation situation a lender may experience, from obtaining duplicate titles to creating sale documents and managing lien sales. We store and manage all the title work required to sell the vehicles we liquidate, and enforce NOI dates and other criteria to help ensure compliance with all related requirements. NPA offers complete repossession management services to powersport lenders, allowing us to take even more pain away from the liquidation process. NPA works directly with repo agents around the country every day, so we know who can get the job done. In addition, our technology and information systems allow us to track every detail of the repossession process so we can optimize recovery rates and turn times. Higher recovery rates means a higher net return to balance for our clients, making NPA's repo management services a wise choice. NPA's Lender Portal provides clients with “real time” access to each and every vehicle 24 hours a day, 7 days a week from your iPad, Tablet or other mobile devices. Current status, detailed condition reports, title specifics, key dates, reporting, tracking and other helpful features are simple and easy to retrieve. The Lender Portal provides unlimited accessibility from assignment through liquidation. NPA believes that hard work and satisfied customers are the only lasting ways to achieve success. We have a great staff of dedicated employees with the experience and knowledge to get the job done right. We love what we do, including serving our customers to the best of our abilities, and we have a great reputation for being fair and doing the right thing. When it comes to the auction business, it's good to know you have someone you can count on. For information on Lender Services please contact Colleen Baldwin at 858.204.0459 or by email at cbaldwin@npauctions.com.